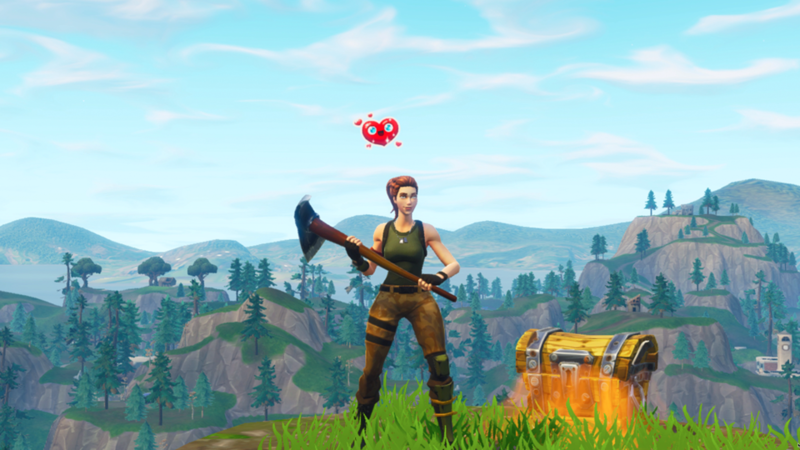 Fortnite is popular for tons of reasons, but chief among it is the "battle royale" style of combat -- 100 random players dropped on an island, foraging for defenses and weapons, and killing each other until only one is left standing. There's no in-game chat, so you have to assume that anyone you encounter is a threat. In such a situation, it's necessarily dog-eat-dog, yes? Nope. As Robin Sloan -- one of my fave writers and thinkers -- discovered, it's also possible to hack a form of cooperation. It works like this: Sloan unlocked an upgrade that lets you display a "heart" icon above your head. So he tried using it as a single-bit mode of game-theoretical communication. When he was dropped into the game, upon encountering another player, he'd refrain from shooting -- and instead toss up the "heart" icon. When it works, it is usually because I have a weapon and my potential ally doesn’t. When (shockingly) I do not blast them and (even more shockingly) do not pull a bait and switch, a real human connection is established, on a channel deeper than any afforded by the interface. Then, very reliably, when the other player acquires a weapon of their own—sometimes it’s a gift from me—there is no double cross. It’s never not tenuous. You both have your weapons out. Sprinting down steep trails, my ally’s footfalls crunching loud in my headphones, either of us, at any time, could flick our wrist and end the other’s game, collecting their stockpile of weapons and resources. When they’re successful, these negotiations are honestly more nervy and exciting than the game’s most intense shoot-outs. As Sloan points out, being able to forge a detente in a situation where robust communication is impossible has some interesting real-world implications. One, as he notes, is that it refracts the "Dark Forest" theory of Liu Cixin, which argues that the reason we haven't encountered any other intelligent life in the universe is that they're keeping their heads low. They've decided that, given the possible hostility of other alien civilizations, and given that robust intergalactic-intercivilization communication might be impossible on first contact, the universe is essentially a game of Fortnite: If someone spots you, they'll zoom in for the kill. But what if the same logic that allows for low-bandwidth-communication in Fortnite also allows for first-blush cooperation with an alien species? Not a bad lesson for inter-human life here on Earth, frankly. Go read the whole essay -- it's terrific! Australia is about to radically expand its copyright and the publishing industry has forged an unholy alliance with authors' groups to rail against fair use being formalised in Australia, rallying under the banner of "Free is not fair." One of the holy grails of computer science is unsupervised machine learning, where you tell an algorithm what goal you want it to attain, and give it some data to practice on, and the algorithm uses statistics to invent surprising ways of solving your problem.